Super-sized meals with king-sized portions have become the norm. Here’s how to portion control to keep the pounds off. 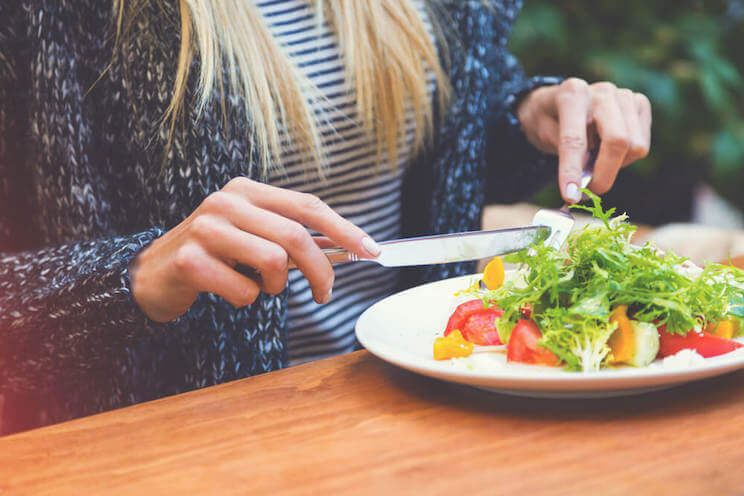 So, it’s no surprise that most people find it extremely difficult to lose or maintain their weight unless they have a clear understanding of portions. 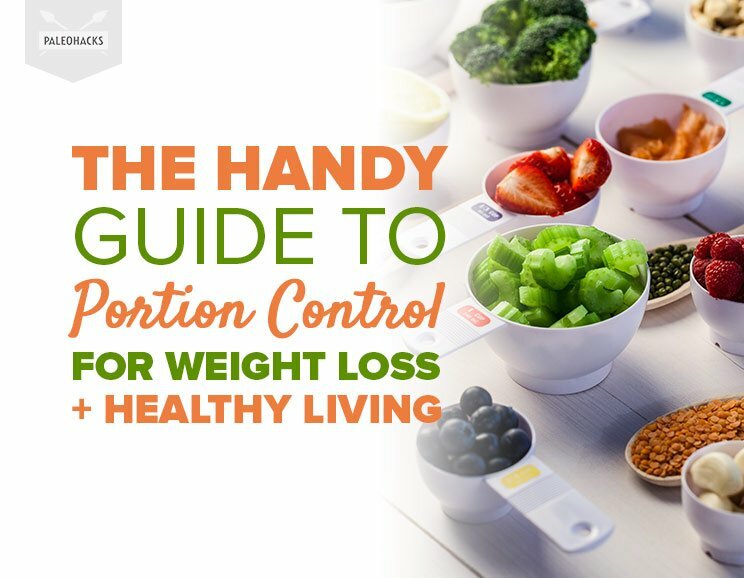 To cut through the confusion and get your portion control back on track, keep reading. You’ll discover the crucial difference between a portion and a serving size, as well as handy tips to know exactly how much you’re eating. In essence, portion distortion refers to the phenomenon that causes us to believe that super-sized portions of food constitute normal meal sizes. We’ve gotten so used to eating large portion sizes that when we do eat a nutritionally proper serving, we feel like we are barely eating anything at all. 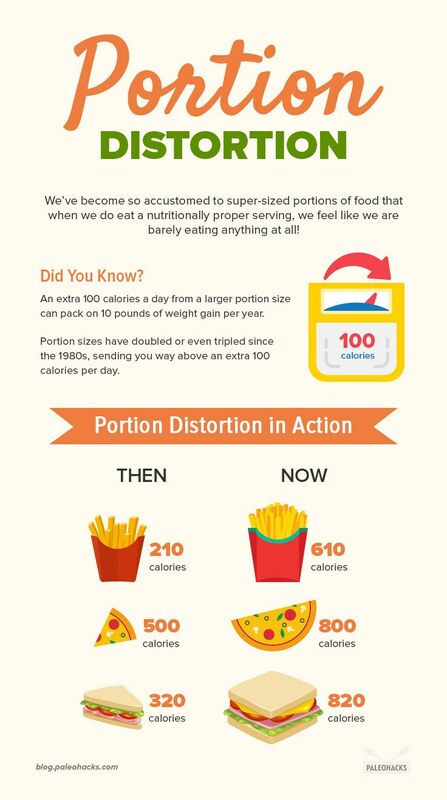 This distorted view of portion size can easily lead to overeating and rapid weight gain as we’re consuming way more calories than necessary. A serving of french fries in the 1980s was 210 calories; today it is 610 calories. A slice of pizza in the 1980s was 500 calories; today it’s 800 calories. It’s easy to assume that one portion of a certain food you eat (say, a sweet potato), is equal to a serving size of that particular food. However, this isn’t the case. A portion of a specific food is the amount you choose to eat for a meal. For instance, you may eat one and a half sweet potatoes as a portion, but that portion will vary based on the size of the sweet potato. A serving size of food is a measured amount of that food, so it’s consistent every time. For example, one cup of cubed sweet potato. When people believe portions and serving sizes are the same, they eat a whole bag of chips thinking it’s only one “portion”, when in fact, it contains three servings or 300 calories. Many foods come packaged as a single portion but actually contain multiple servings. What looks like a three-ounce bag of potato chips (one portion), may contain three actual servings of chips. Why is this distinction important? Because, when people believe portions and serving sizes are the same, they eat a whole bag of chips or drink a whole bottle of juice thinking it’s only one “portion”, and therefore contains only one “serving” of 100 calories, when in fact, it contains three servings or 300 calories. This confusion can easily lead to overdoing it on calories, sugars, and carbs, leading to blood sugar spikes and weight gain. Get into the habit of reading the labels on all of the foods you’re eating. Snagged a bag of plantain chips? Make sure that when you see that one serving has, for example, 160 calories that there is only one serving in the bag. When you purchase foods that have multiple servings, make sure to individually repackage them in recyclable bags or containers as one serving size. This helps keep the tendency to carry on snacking through the bag in check and also helps you to visualize a single serving size. Typically, portion sizes in restaurants are larger than average. This can easily lead to consuming an abundance of calories, even when you think you’re choosing something healthy. A good way to portion control in this situation is to ask how many ounces of meat are in a dish (3 to 4 ounces equals one serving). You can also get into the habit of eating half and saving the rest for later. Instead of setting food directly on the dinner table, try leaving it on the counter. This allows you to eat only one or two portions, then assess for 10 minutes whether you’re actually still hungry, then (and only then) get up for more. If the food is in front of you, you’ll be more likely to reach for seconds without thinking. Studies show that the slower you eat, the fewer calories you consume. (5) This may be due to the time it takes for your brain to register it’s full, which is about 10 to 15 minutes. When you eat your meals, slow down and savor the food. Many people find wiping their mouths with a napkin between each bite helps cut the urge to eat too quickly. 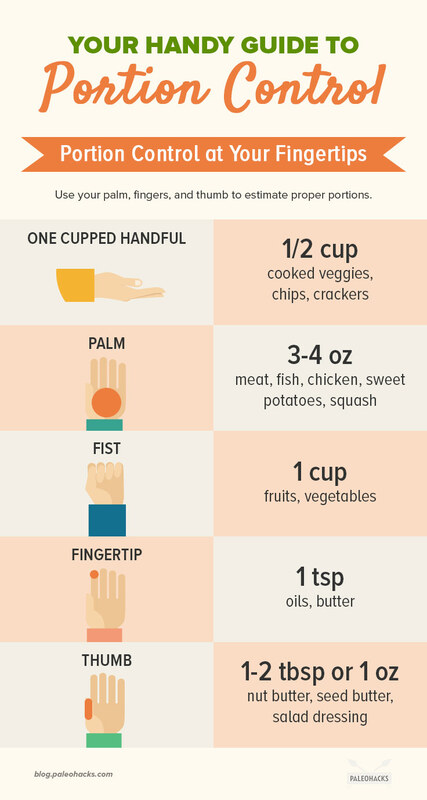 Here’s a handy way to gauge portion sizes: Use your hands! Portion control doesn’t have to be complicated. It’s simply a matter of getting into the habit of reading labels and training your eyes to identify correct serving sizes versus what appears to be “normal” portions. Why Try a Low-Carb Diet?